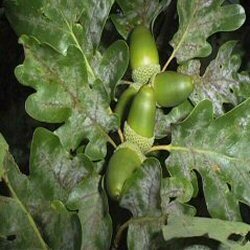 Sessile means without stalks, and quite simply this means that the acorns of Sessile Oak (Quercus petraea) are stalkless. A native, British tree, the distinctive leaves are in our opinion more attractive and healthier than those of English Oak and arguably a finer tree too! There is some debate as to whether the two varieties are the same. See English Oak. A fast-growing tree, this tree is more common in the western parts of the Britain, Wales, the Lake District and western Scotland. Expect a final height of a mere 43m (143ft).